StratSketch has gone through a lot of updates lately, many of which have added small but useful features that have been requested. In this tutorial, I'll show you some of the hidden features you may not know about. If you are showing your clan a strategy and want to move to a new map, it can take a while for everyone to copy and paste the ID and join a new briefing. In the latest update, a checkbox has been added to the join/create windows that allow you to transfer all users in your current briefing to a new briefing. Note that this option is only available to the creator or editors of a briefing, and at least two users must be in the briefing for it to be present. Text can be formatted using a simple variation of markdown. Using the characters *, _, and ~, text can be made bold, italicized, or underlined. Markdown can also be used in chat. In chat, you can also paste briefing IDs that become clickable links. By typing a number and then "x" in the tank name field, that number will be added to the total tank count. This feature may already be well known to some, however it is a bit hidden if you have never clicked it. The icon with a path splitting into two, next to the edit icon, allows you to create a copy of a briefing. You can do the same for a slide by right clicking on it. With a copy of the briefing or slide, you can create alternate plans without affecting the old version. To prevent users from creating a copy or favoriting a briefing for later use, the creator of a briefing can enable protected mode. 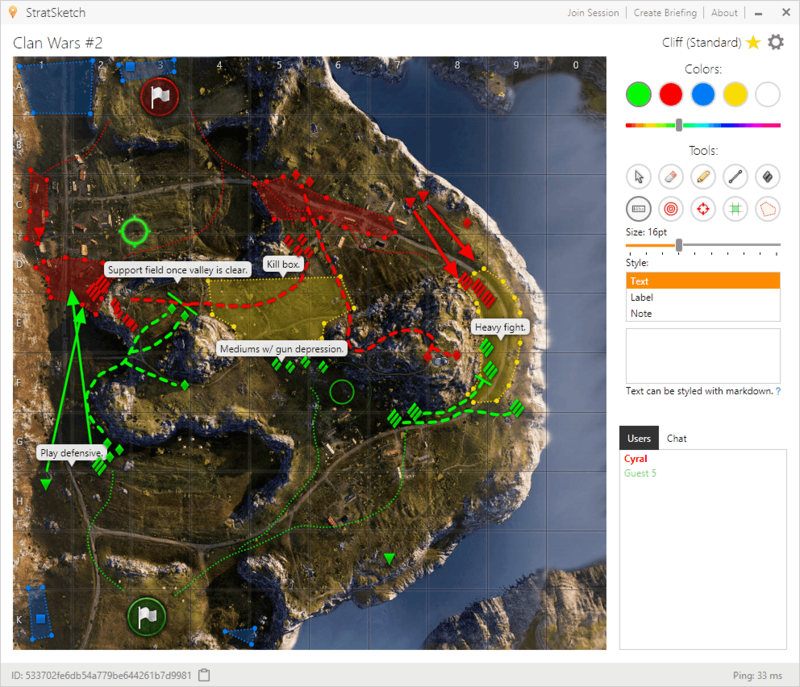 StratSketch 1.3.2 for World of Tanks 9.9 has been released. In this update, many small features have been implemented, and many bugs have been fixed. All of the maps are now in much higher quality. Briefing creators or editors can now transfer all users to a new or existing briefing. Briefings can be protected for added security. Protected briefings cannot be copied or favorited. Map screenshots are now in much higher quality. The 0-9 keys can now be used to select tools. All users will no longer see themselves as a different rank when one user's rank changes. Map spawn points and versions have been corrected. The briefing description is no longer hidden behind the map if it is more than two lines. As always, if you have any suggestions or comments, check out the StratSketch thread on the World of Tanks forums. StratSketch Update 1.3.0 - Slideshows! The latest StratSketch update adds a major and frequently requested feature: Slideshows. 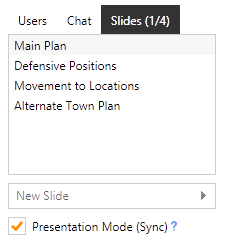 You can now add slides to your briefing, as well as create copies of existing slides to create alternate strategies. When presentation mode is enabled, all users will follow along with the presenter to each slide. If you have any suggestions or comments, check out the StratSketch thread on the World of Tanks forums. Enjoy! Today I am releasing the StratSketch update for World of Tanks 9.8. I've have added quite a few useful features as well as updated the maps to the latest versions. Added a grayscale color slider. Made multiple tanks count towards the total using the syntax of "#x", which will add # of tanks to the total. Added the ability for map owners to kick users from their briefings. Added the ability for maps to be hidden to regular viewers by the map owner and helpers. Implemented an auto-reconnect. If a user becomes disconnected from a (saved) briefing, the client will try to reconnect automatically. Made the select tool auto-select after placing text, making it easier to move it. The textbox is now cleared after placing as well. Fixed a few minor bugs and issues. The Pyratron Community forums are now up! This will be our new hub for discussing our projects, such as our upcoming game, Bricklayer. Your current Pyratron account will work on the new forums. See you there!